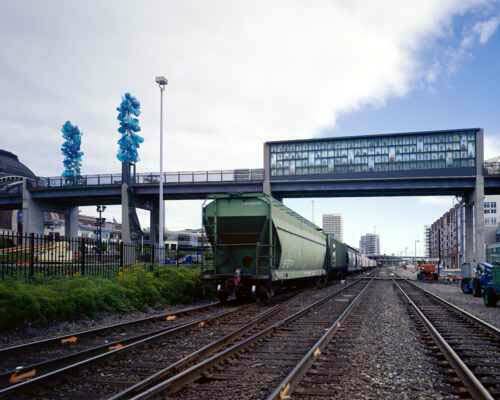 Tacoma, Washington: An architect and an artist combine visions for a pedestrian crossing. 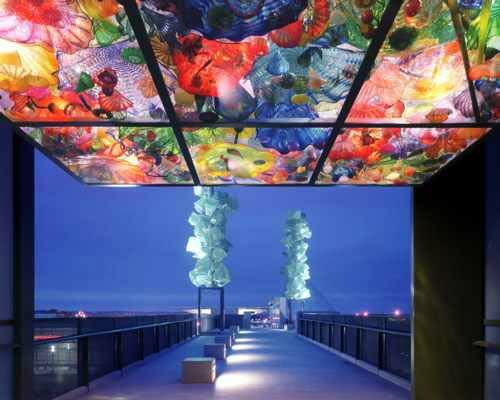 A successful collaboration with renowned artist Dale Chihuly gave rise to the Bridge of Glass. 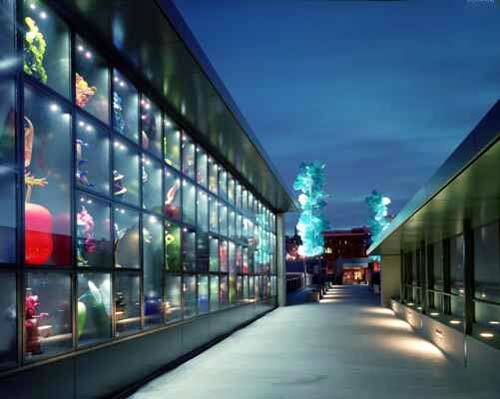 Through the synthesis of art and architecture, Andersson-Wise Architects and Chihuly sought to create an enduring and experiential public landmark for the City of Tacoma. We worked together, evolving this unique concept, over the past eight years. Dale and I studied the great bridges of the world. We discovered they all had one thing in common: they all spanned a river, gorge, or some other natural obstacle. Our context is different: our river is a river of cars and trains; our gorge is a gorge of concrete and metal. 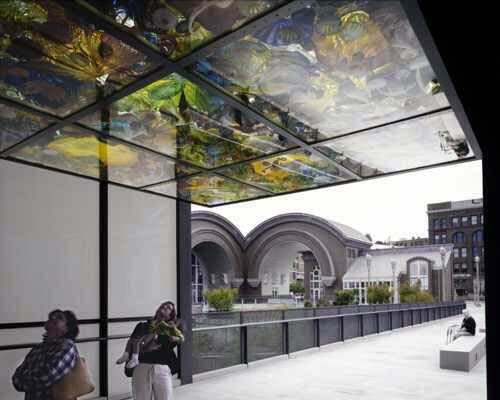 The bridge, which opened July 6, provides a crucial pedestrian connection linking Tacoma’s new Museum of Glass and surrounding waterfront and with its the developing historic/cultural district. Both areas are undergoing extensive urban revitalization; which, until now, Interstate 705 and the rail lines below the bridge’s span have physically separated them. More than a way to move from point A to point B, the Bridge of Glass is an important, energized public experience. It was essential to allow visitors to pause, sit, look, and be enveloped in Chihuly’s art, which is the focal point of the bridge itself. Site-specific pavilions respond to the different types of sculptures and objects featured, creating different worlds of Chihuly glass. The bridge grows from its material context of concrete and steel. Massive concrete supports and the painted steel superstructure have a powerful yet neutral presence that stands in contrast to Chihuly’s artwork. The idea was not to compete for attention but to create a prosaic counterpoint to the poetry of glass. Chihuly designed the Crystal Towers to soar nearly 40 feet above the bridge’s center section, forming both a grand urban gesture and a new landmark for Tacoma. As the towers flank the inbound side of the freeway, they serve as a visual gateway to downtown. The sculptures rest on steel pedestals atop the bridge’s centermost piers. Their placement makes them more stable. Two semi-enclosed pavilions – the Seaform Pavilion, on the east side of the bridge, and the Venetian Wall to the west – were created as experiential installations of Chihuly’s art. Their design provides a minimal frames for the glass, to visually suspending the pieces in midair. With active truck and train traffic below, the pavilions play an important role in sheltering pedestrians from noise and wind. Solid edges prevent visitors from seeing the art until they are inside. The rhythm of the bridge structure provided an opportunity for syncopation of the pavilions. Two concrete piers border the Venetian Wall, forming edges for its orderly grid. A single pier bisects the Seaform Pavilion, allowing the undulating installation, with its implication of infinity, to float in both directions. 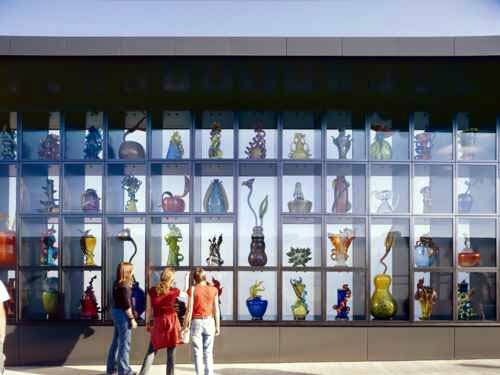 I worked with Chihuly and A. Zahner Company, a noted Kansas City architectural metal company, to define an architectural palette that would best compliment the art. Zahner’s team fabricated the pavilions from blackened stainless steel, which has a satin finish that is both neutral and non-reflectiveWith active truck and train traffic below, the pavilions shield pedestrians from noise and wind.
. Tinted, translucent glass panels illuminate the southern and northern sides of the pavilions, allowing viewers to immerse themselves in the experience without distraction. The project was funded through a combination of federal, local, and private funds. Construction began in spring 2001. The bridge structure is 500 feet long by 20 feet wide and rises 35 feet above the road. 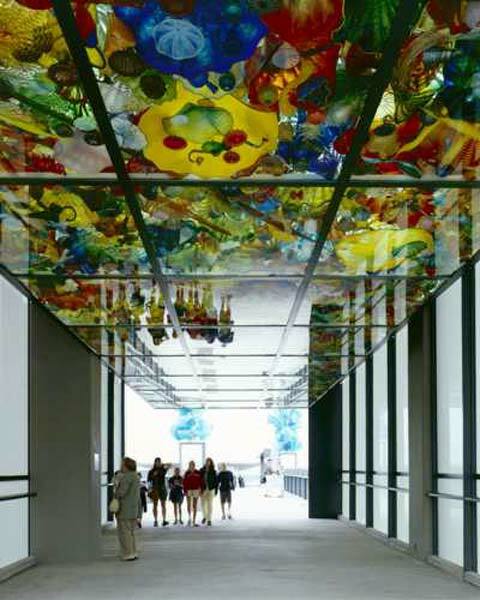 - Museum of Glass: International Center for Contemporary Art: Opened July 6, 2002, the museum and glass hot shop were designed by Arthur Erickson Architects of Vancouver, BC. - Renovation of 1911 Union Station and expansion of the Federal Courthouse: The Tacoma firm of Merritt+ Pardini rehabilitated this local landmark in 1992. 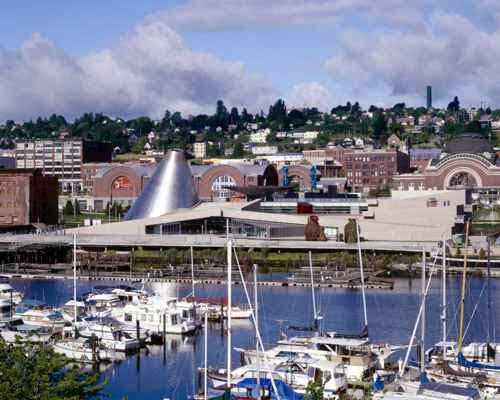 - Washington State History Museum: The first new building and a catalyst for the historic district’s rebirth, the museum was designed by Arthur Andersson and Charles Moore, and completed in 1996. A pedestrian bridge from the museum site to the waterfront was part of Moore/Andersson’s competition-winning scheme. - Tacoma Art Museum: This new museum, designed by Antoine Predock, is under construction on Pacific Avenue, neighboring the Washington State History Museum and Union Station. - University of Washington Tacoma campus: The Tacoma satellite campus, which focuses on science and technology, is under development on a large site in the hills behind Pacific Avenue. Moore Ruble Yudell Architects of Los Angeles designed the master plan. - Thea Foss Waterway mixed-use: A public walkway, cultural facilities, parks, hotels, offices, shops, and restaurants are under development on the once-blighted downtown waterfront, adjacent to the new Museum of Glass. - Greater Tacoma Convention Center: This $87 million, 230,000-square-foot facility is scheduled for completion in 2004. The design team includes Merritt+Pardini Architects; Wyn Bielaska; MulvannyG2 Architecture; Nakano Associates (landscape); and artists Stuart Keeler and Michael Machnic. Andersson-Wise Architects was founded in 2001 by Arthur W. Andersson and F. Christian Wise following a 15-year collaboration together and with Charles W. Moore, first as the Charles Moore Studio and later as Moore/Andersson Architects. Moore and Andersson began working together in 1981 when they collaborated on the White River Park Project. Shortly thereafter, they co-designed the Wonderwall and Centennial Pavilion at the New Orleans World’s Fair. Wise joined the firm in 1985 as a principal design collaborator for the studio. Moore is recognized as having been one of this century’s greatest architects - his work, writing, and teaching have profoundly influenced the course of architecture worldwide. By practicing and evolving his teachings, the firm has become a design collaborative of 12 architects and designers, dedicated to excellence in public, religious, commercial, and residential design. 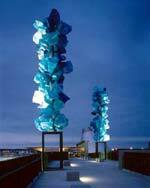 Dale Chihuly lives and works in Seattle, Washington. He was the first American to work in the Venini factory in Venice, Italy, and in 1969 established the glass program at the Rhode Island School of Design where he taught full time for 11 years. 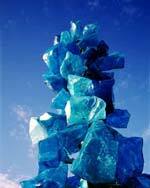 In 1971, he co-founded the Pilchuck Glass School in Stanwood, Washington. His well-known series of works include Baskets, Seaforms, Persians, and Venetians. In 1995 he embarked on the multifaceted international project, Chihuly Over Venice where chandeliers, some 20 feet long, were suspended over canals and the piazze of Venice. In 1999, he mounted Chihuly in the Light of Jerusalem 2000, an exhibition of large-scale sculptures within the stone walls of an ancient military fortress, which is now the Tower of David Museum of the History of Jerusalem. 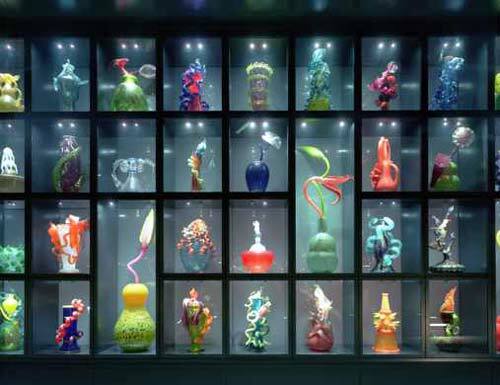 During the summer of 2001, Chihuly hosted a major exhibition at the famed Victoria and Albert Museum in London, England. His first major glasshouse exhibition, “Chihuly in the Park: A Garden of Glass” was recently presented at the Garfield Park Conservatory in Chicago.